This new Nikon Coolpix S6600 were introduced today and is an upgrade from the Nikon Coolpix S6500. For the most part it is the same camera, but there are some differences. 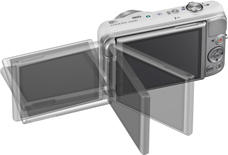 The main one is the LCD screen that can be flipped and you can use gestures to operate the camera. This sound great, but when you think about it how often are you really going to use gestures to operate the camera? My guess is not much. The camera doesn't seem to come to USA at this point in time as it was only announced on the global site and the European site, but it might get to the USA at a later point. To keep up with what comes of articles about the new lens. Keep and eye out at it page on Nikon Index, where I will update the pages as I find more information.